For those of us in the northeastern United States, a quick check of the calendar shows that the time will soon be upon for us to hang up our shovels and put away our parkas. Thoughts of picnics, beach trips, cycling, softball, basketball, camping and a whole host of other outdoor activities (where UV Skin safety should be considered) are already starting to rent space in our minds. Because here, finally, the temperatures will shortly start returning to the levels most of the country enjoys the whole year ‘round. In our anxiousness to shed our winter wardrobes for the much less bulky attire of spring and summer, it’s perhaps understandable that UV ray protection might not right away spring to mind. That’s why we’re here today with this gentle reminder. 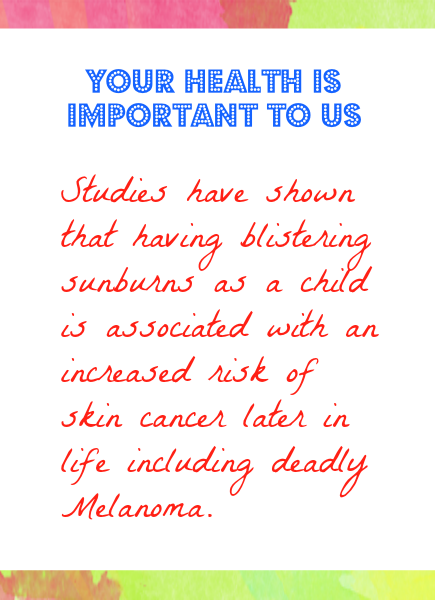 The sun’s harmful UV rays will impact you the second you step outside. And without protection against them, you’ll be exposing yourself to all sorts of sun skin damage; and none of it good. Pre-mature aging, wrinkles, sun spots, rashes, sunburns, skin cancer and Melanoma are just some of the afflictions our solar system’s brightest star can cause. And it’s vital to remain wary of that fact. Sunscreen, and equally important sunscreen re-application, is crucial. Just throwing on one coat of sunblock and calling it “good enough” isn’t, well, good enough. Its effectiveness wears off over time if you do nothing; and even faster if you’re moving around, sweating or swimming. And you’re almost certain to be doing two out of those three. Also while outdoors, wear hats, sunglasses, long sleeves and pants. When possible, stay out of the sun during its generally accepted peak hours of 10a.m. to 4p.m. If that’s not feasible, do whatever you can to stay under either natural or artificial shade, such as trees and awnings. We all want to enjoy the return of spring; we just want you to celebrate it safely! « Flu Season – What Does That Mean For Your Skin?